Left-arm leg-spinner Ekta Bisht’s five wickets helped India to make hat-trick of win in the ICC Women’s Cricket World Cup round robin match. Chasing the modest target of 170 runs of the Indian team, Pakistan’s team all out on the total of just 74 runs in 38.1 overs. Spinner Ekta Bisht took 5 wickets for 18 runs, fast bowler Mansi Joshi got two wickets while Jhulan Goswami, Harmanpreet Kaur and Deepti Sharma also took one wicket each. Team India scored just 169 runs for the loss of 9 wickets in 50 overs. Opener Poonam Raut scored the highest 47 runs while Dipti Sharma scored 28 runs. 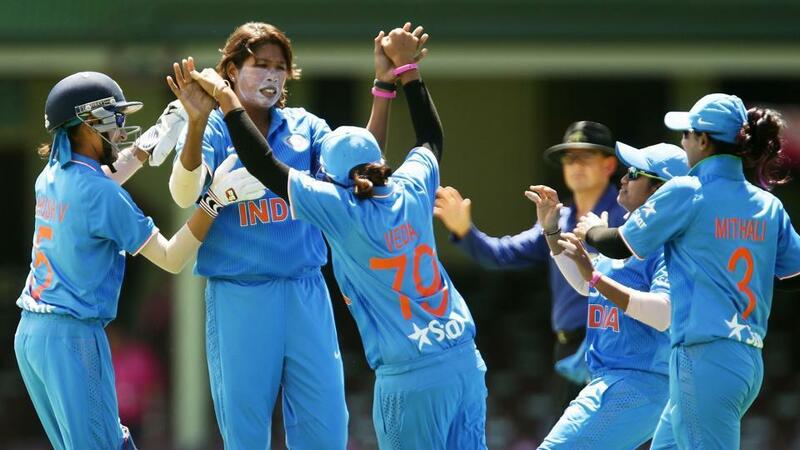 Sushma Verma (33) and Jhulan Goswami (14) added 34 runs for the seventh wicket and played a key role in helping the team reach the 150-run mark. Pakistan’s chase was very bad and they lost four wickets in 8th over for 14 runs. After that Pakistan team was unable to make come back in the match and they lose the match by 95 runs. India are at the top of the table with six points from three wins in three matches, while Pakistan have lost all their three matches.